Configuring email account on your mobile phone makes your life easy to access and reply to all your emails without the use of a computer. The following steps will help you configure your email account using Samsung Galaxy S series mobile phones. 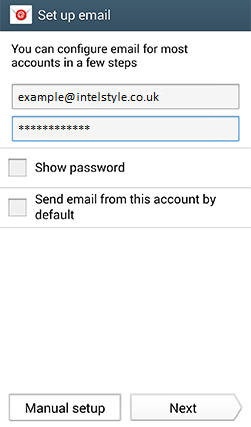 Enter email address (if you are adding a second account then you click the 3 horizontal lines in the top right corner and click ‘MANAGE ACCOUNTS’ then click + sign in the top right). 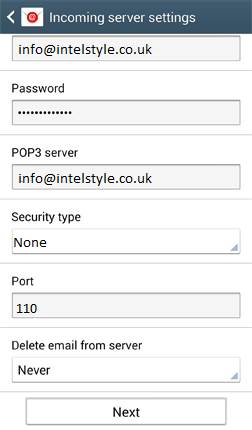 Your email’s provider settings will be loaded automatically and the email application will load. 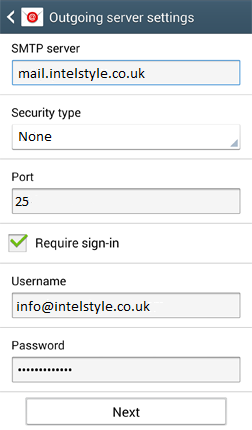 Tap ‘Manual setup’ (for this option you need to enter your provider’s details manually). 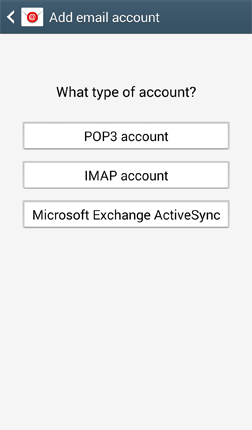 Select one of the two options (POP3 or IMAP) (POP3 deletes emails from server after download to your device but IMAP keeps a copy on the server so that you can access from other devices in the future). You need to find Incoming and Outgoing server details from your email provider, majority of the time that is your hosting company. Tap the Sync options and click Next.